Bharat Book Bureau Provides the Trending Market Research Report on “Global Skincare Product Market by Type (Face Creams and Body lotions), by Face Creams (Skin-Whitening Cream, Anti-acne Cream, Anti-Aging Cream, Sunscreen Lotions and Others), by Distribution Channel (supermarkets, hypermarkets, speciality stores and online channels); Size and Forecast by 2016-2025”under Personal Care Category. The report offers a collection of superior market research, market analysis, competitive intelligence and Market reports. 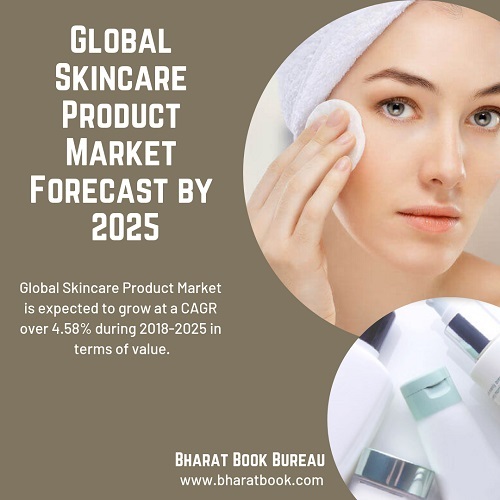 Global Skincare Product market report provides analysis for the period 2016 – 2025, wherein the period from 2018 to 2025 is the forecast period and 2017 is base year. The market study reveals that the global skincare product market is expected to grow at a CAGR over 4.58% during 2018-2025 in terms of value. The market is expected to reach over USD 1,84,400 Million by 2025. This growth is driven by a number of reasons such as, rise in disposable income, technological advancements, growing awareness for health & beauty, rise in the male grooming market, increased demand of anti-aging products coupled with easy availability of skincare products via modern stores & e-commerce channels etc. The market overview section of the report demonstrates market dynamics such as drivers, restraints, and opportunities that talks about the current nature and future scenario of the said market, key market indicators, end-user adoption analysis. Further, key market indicators included in the report provide the significant factors which are capable to define the market position of global skincare product. On the basis of the type of product, the market is segmented into Face creams & Body lotion. Based on the type of Face creams, the market is further divided into Anti-aging products, Skin-Whitening products, Anti-acne products, Sunscreen lotions & some other products. Based on the channel of distribution, the market is categorized into Supermarkets, Hypermarkets & Specialty stores, online channels and other available channels. Finally, the report covers the analysis of these segments across North America, Europe, Asia Pacific, Middle East, and Africa & Latin America along with the qualitative analysis for market estimates that boosts the growth of the global skincare product market during the forecast period. The report also highlights the competitive landscape of the global skincare product market that includes the company overview, products & offerings, strategic decisions taken by the company, launch of new products and financial highlights. Extensive secondary research was conducted using paid data sources including Bloomberg, Factiva, Capital IQ, OneSource, and Hoovers. Additionally, several publicly-available data sources were used including journals, statistics articles, and industry associations. These data sources were used to gather relevant information to develop an understanding on the global skincare product market. The research was conducted covering the desk research and primary research. Data sources used for primary research included online forums and blogs, CATI/CAWI, CAPI interviews, and video conferences. Additionally, interviews were conducted through connecting with various industry respondents including C-level executives, directors, divisional heads, regional heads, expert consultants, and independent consultants. The primary research was conducted to gain market insights from industry respondents and validate the gathered information through desk research. The global skincare product market is dominated by a number of players, amongst them the major players are L’Oreal S.A, Unilever PLC, Beiersdorf A.G, The Estee Lauder Companies Inc, The Colgate-Palmolive Company, Johnson & Johnson, Avon Products Inc, Shiseido Company Ltd, Procter & Gamble Co, Revlon Inc.